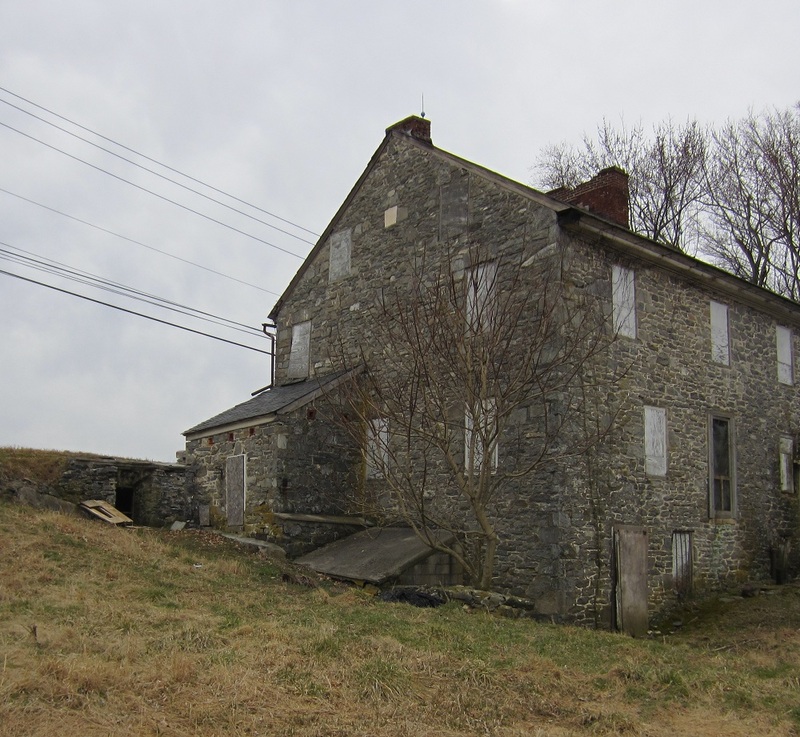 A beautiful old uninhabited farmstead, hand built stone by stone. It’s on the way to town and I’ve driven by it countless times over the years. I can’t help but slow down and look. This is a beautiful home as it was made. It stirs the dust of anyone’s imagination. Who built this and when? What were their lives like? 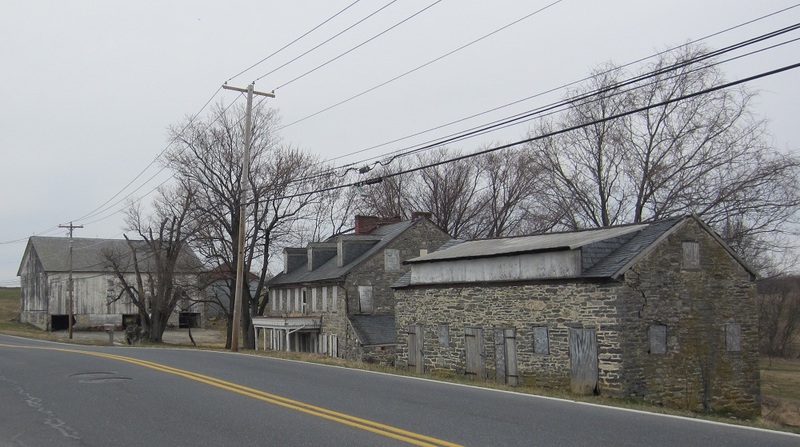 It’s quite a contrast seeing the original farmhouse and stone building against the modern yellow lined road and telephone poles. In it’s heyday, the road was of dirt or mud and traveled by horse. Time to slow down and pull over for a closer look at some beautiful hand made history. Beginning with the side building, I’m not sure what it is, or how many uses it had. 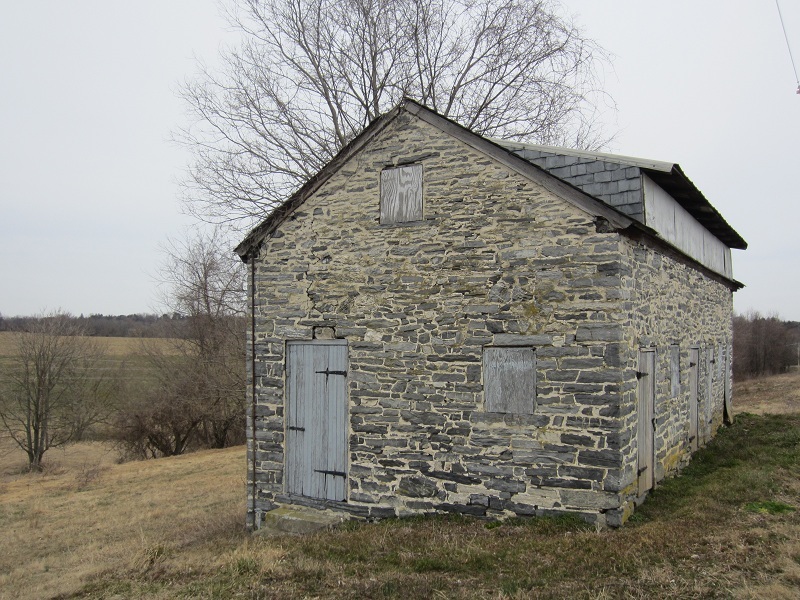 It could have been a hen house, or an early market along the road to sell produce. It’s not a carriage house, as all the doors are too small. Whatever it is, it’s been there for about 200 years. Many interesting doors and windows. Long since boarded up. Note the roof shingles hand made from local slate. In those days you didn’t just see a real estate agent and settle on a price. You purchased the land; you built your home yourself. You cleared the timber and fieldstones and you were the building means. 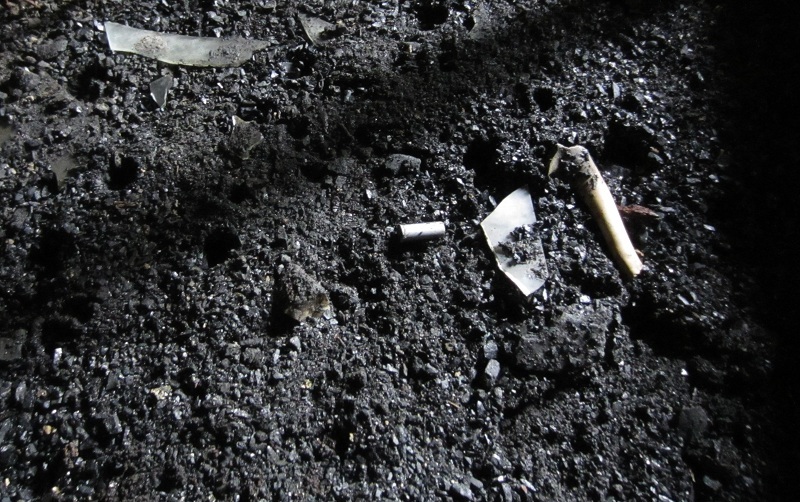 You cut wood and burned it or coal in the fireplace or stove as your only source of heat. You farmed with back breaking labor and hoped for the best come harvest time. A hot bath was a luxury. The side closest to the house. 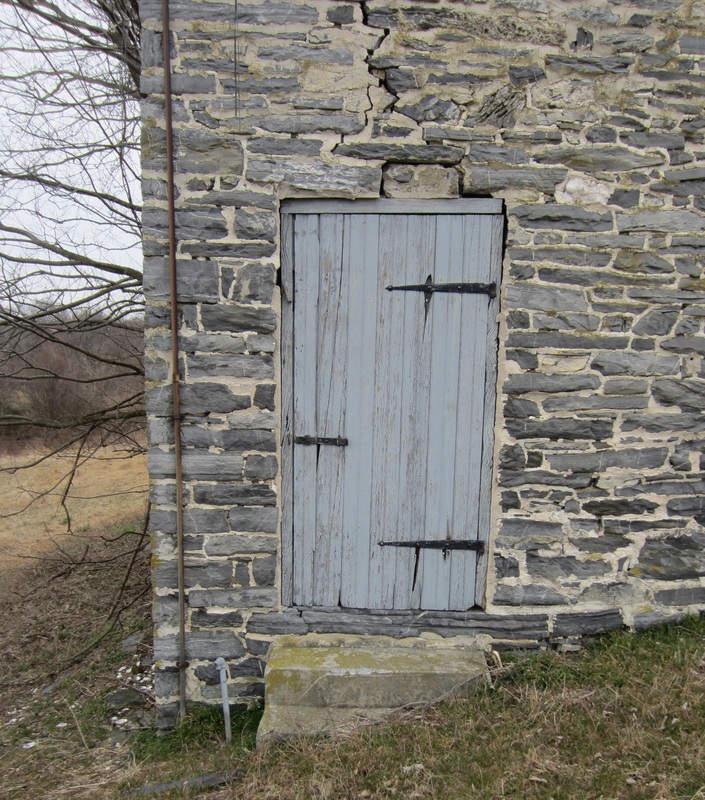 This door is beautiful and seems to have escaped most of the weathering of the front ones. The old repairs and the settling cracks definitely add character. Not to mention the hand forged iron hinges and handle. The gray blue paint matches tones with the stone walls beautifully. When did this door get it’s last coat of paint? The house is lovely and primitive. Standing proud even with all its eyes boarded shut. 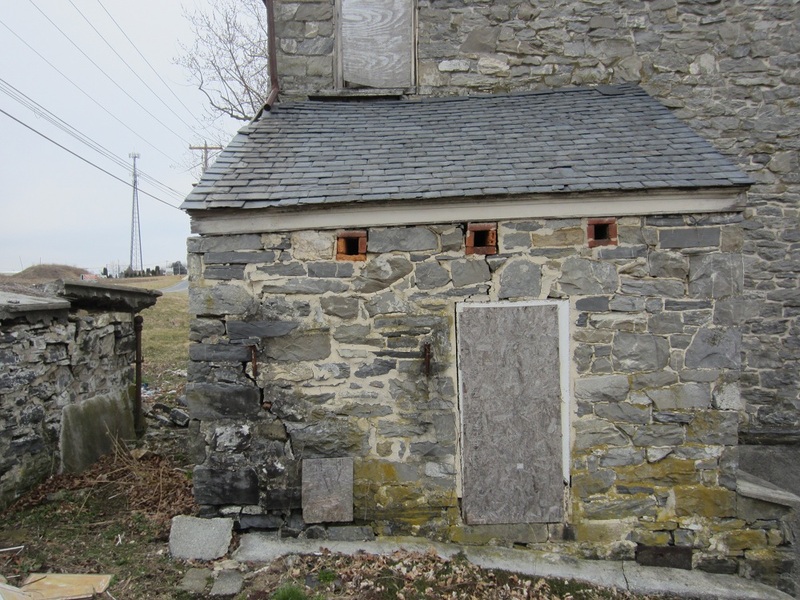 The slate roof shingles are in a very good state of preservation. 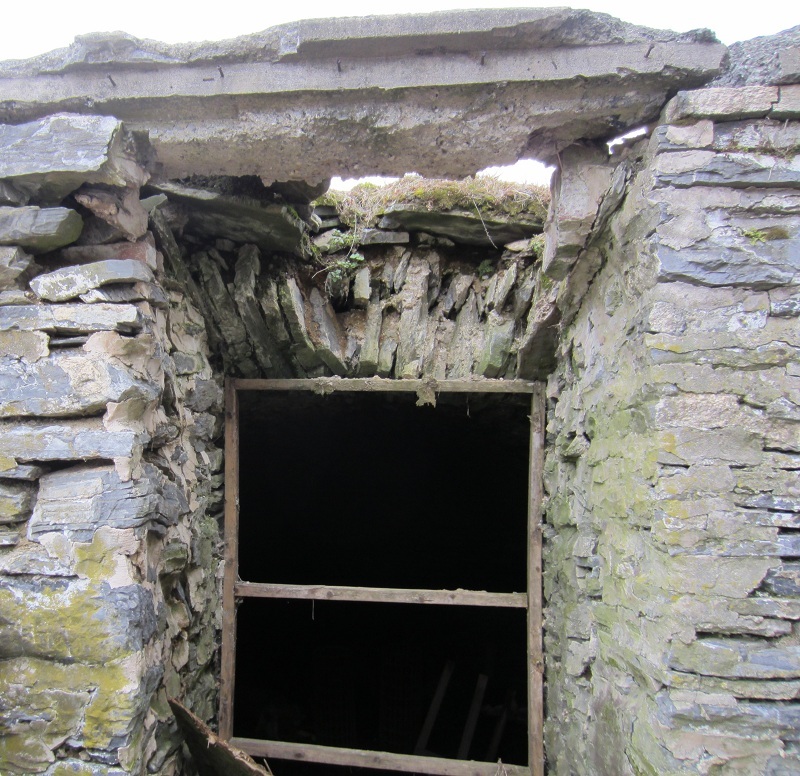 An extremely well built house which will likely still stand for a few hundred more years. 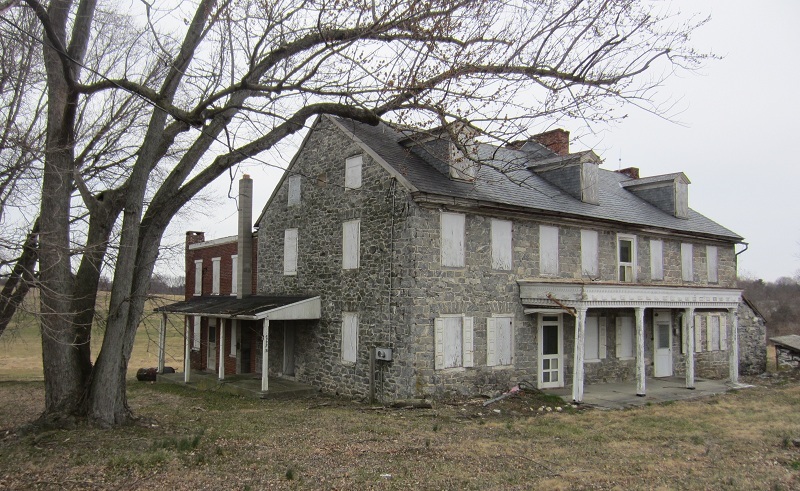 The house actually has an older side (the left side,) and the right half is an addition, although as we’ll find, not dated much later. The farmhouse I live in is similar to that. I love living in such an old area. Fascinating historic sights are around every corner or just down any road. There’s at least 1000 words above as the saying goes. One for every stone and shingle and flake of peeling paint. The ground right under the above picture, as you will see, will prove most unusual, and to me, unforgettable. 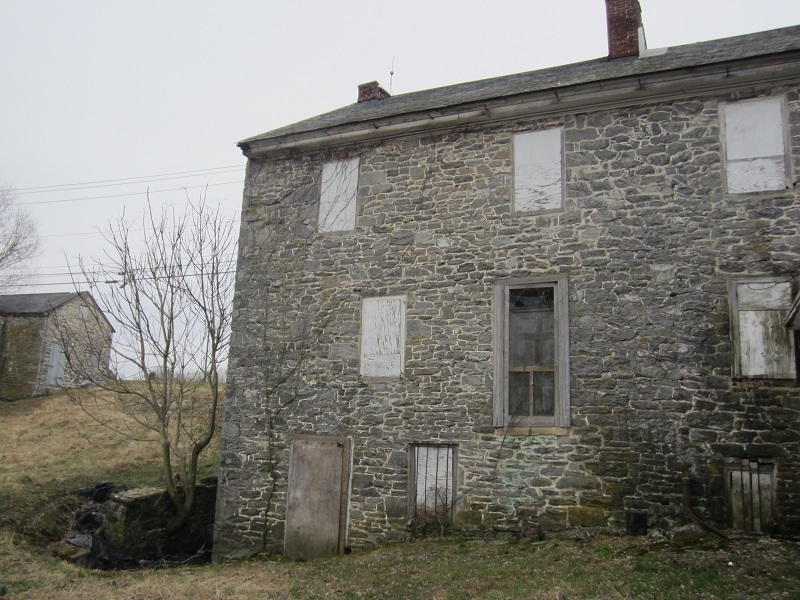 This proved more thought provoking than just some pictures of a very old farmstead. Seeing the house from the western side. 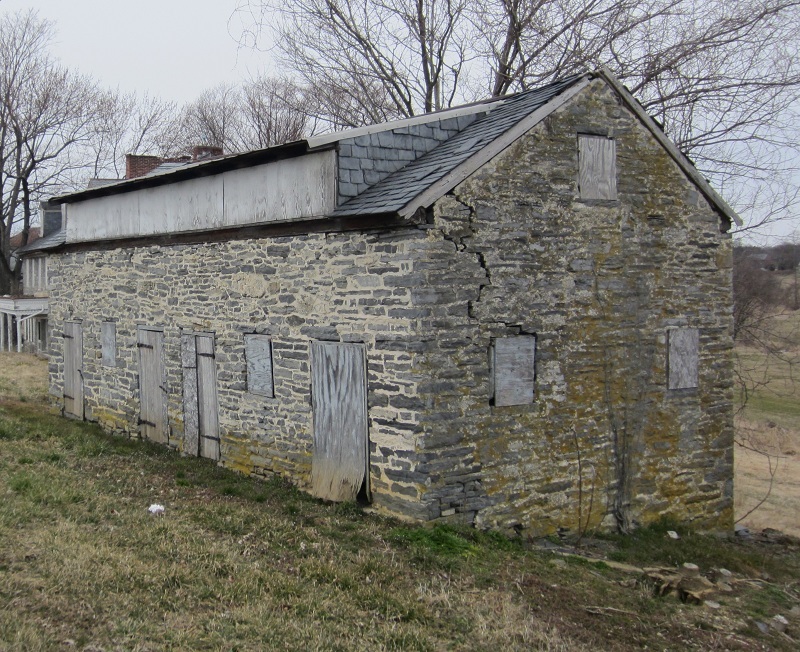 The brick addition is most likely late 19th to early 20th Century. It’s not a modern addition, that’s for sure. 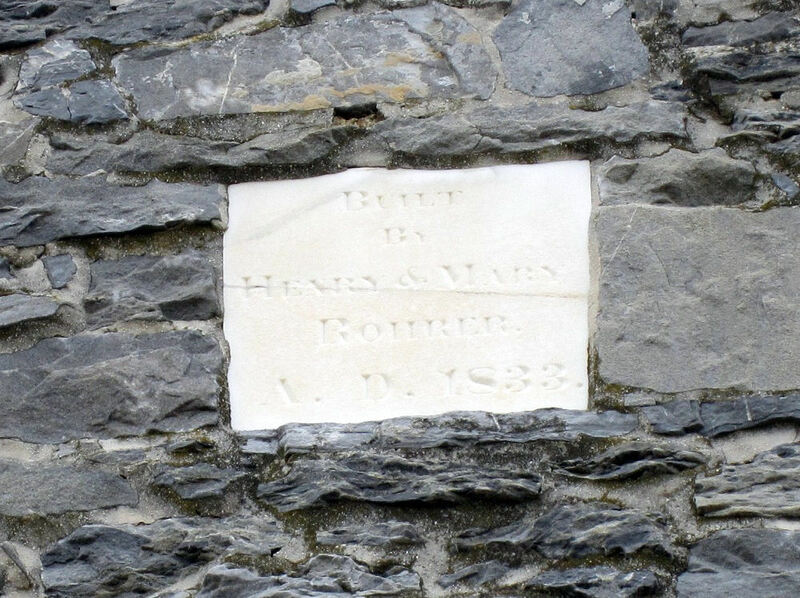 It’s on this side that the earliest date and house identification can be seen as featured below. This is high up and between the two very top boarded windows. 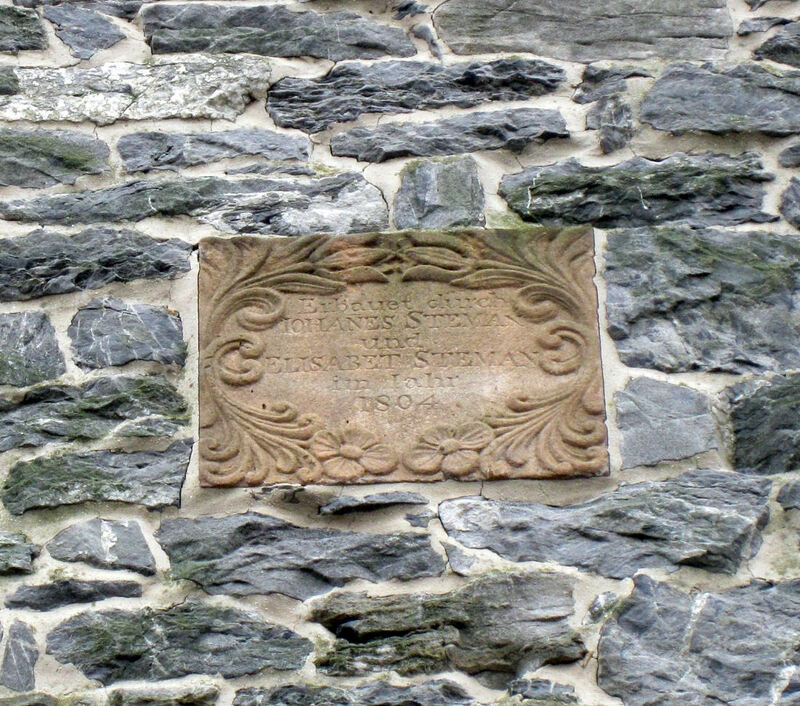 Which roughly translates from German to: ‘Built through Johanes and Elizabet Steman in Year 1804.’ This was the oldest date seen on the house, but not the only date. On the newer, but not by much, east side of the house, there is this stone, also with names and dates shown below. The name Rohrer is very commonplace around here. One has to drive down Rohrerstown Road, just around a bend to pass by this house. 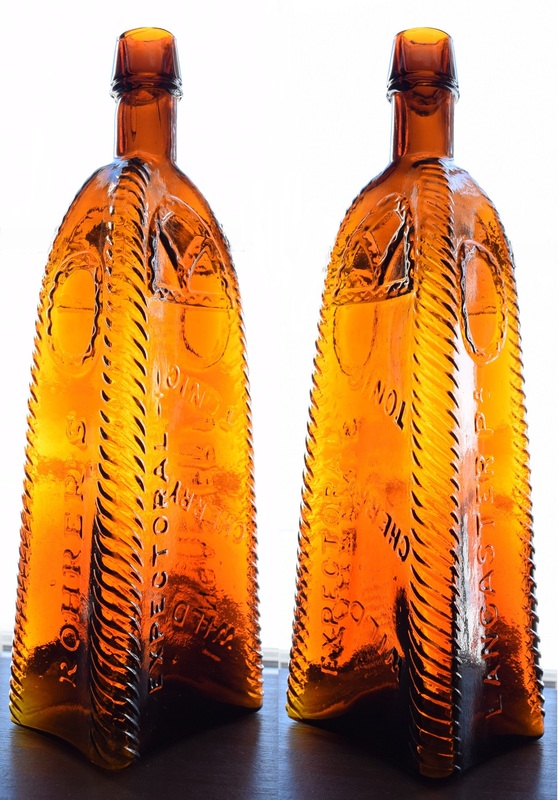 Interestingly enough, there’s a well known 1800’s bottle that features the Rohrer name. It’s unknown to me if this is the father or a relative of J. Rohrer, maker of the ” Expectoral Wild Cherry Tonic,” with “Lancaster, Pa.” embossed on it. This is a spectacular bottle. 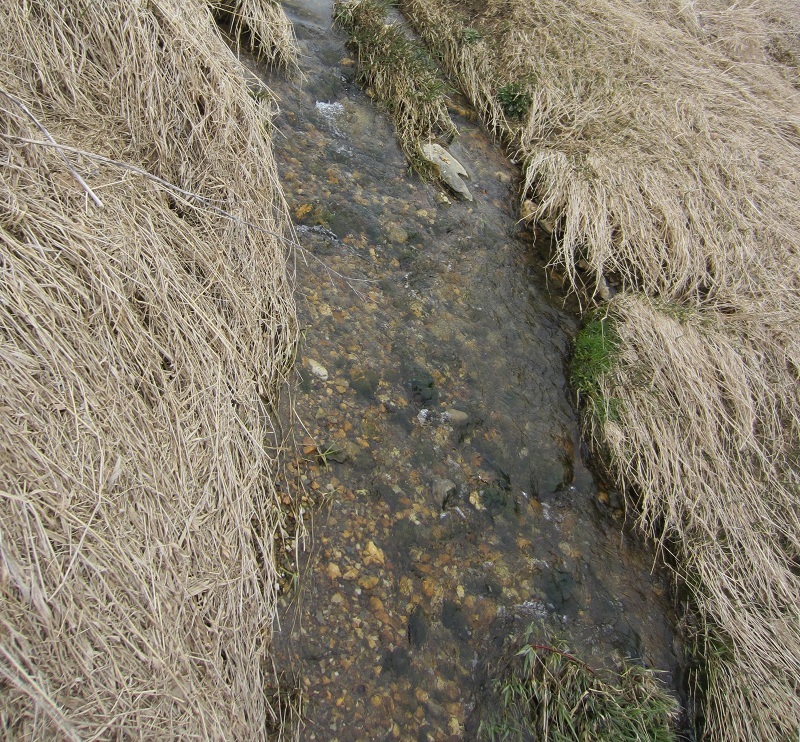 The back looking up from a clear running, very peaceful, small stream. 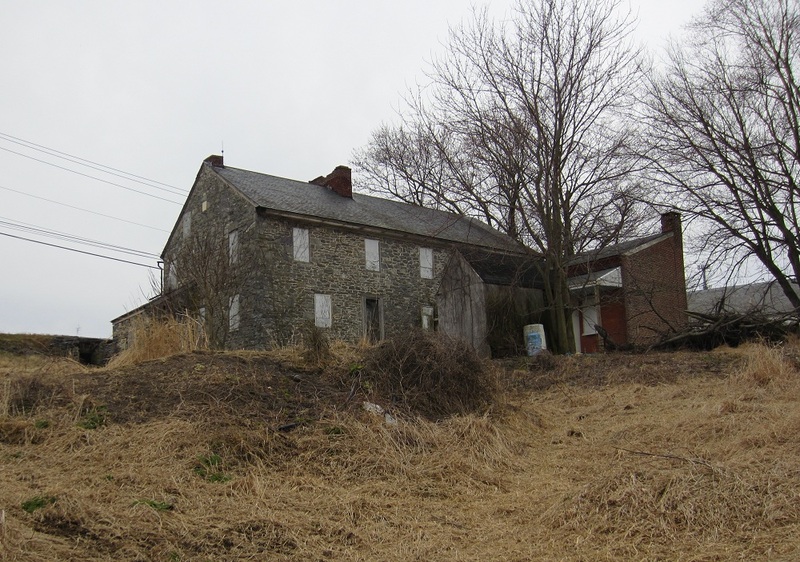 Another closer look at the older, original back of the house. Note the stairs are long gone from the back door which is about five feet above ground level. A very lonely door. When was the last time it was used? 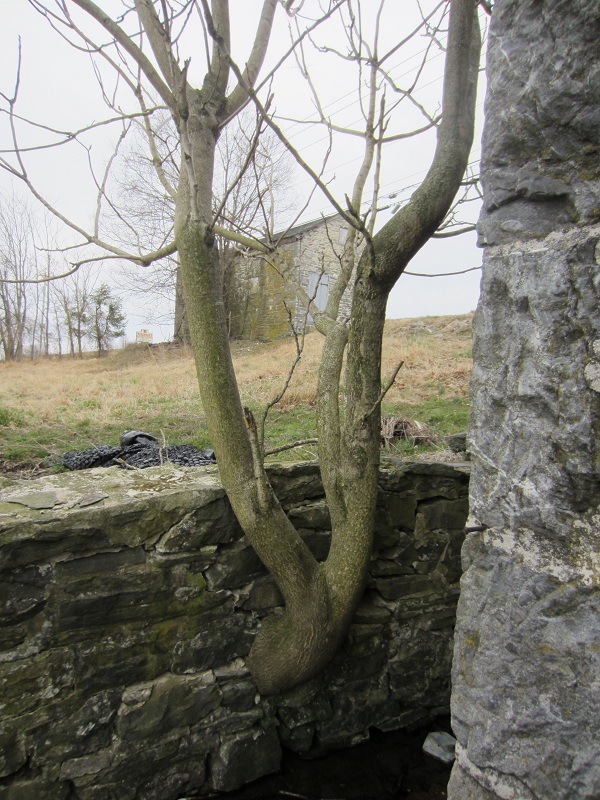 Note the tree on the left, growing right out of a stone wall. Also note the black bucket to the right. 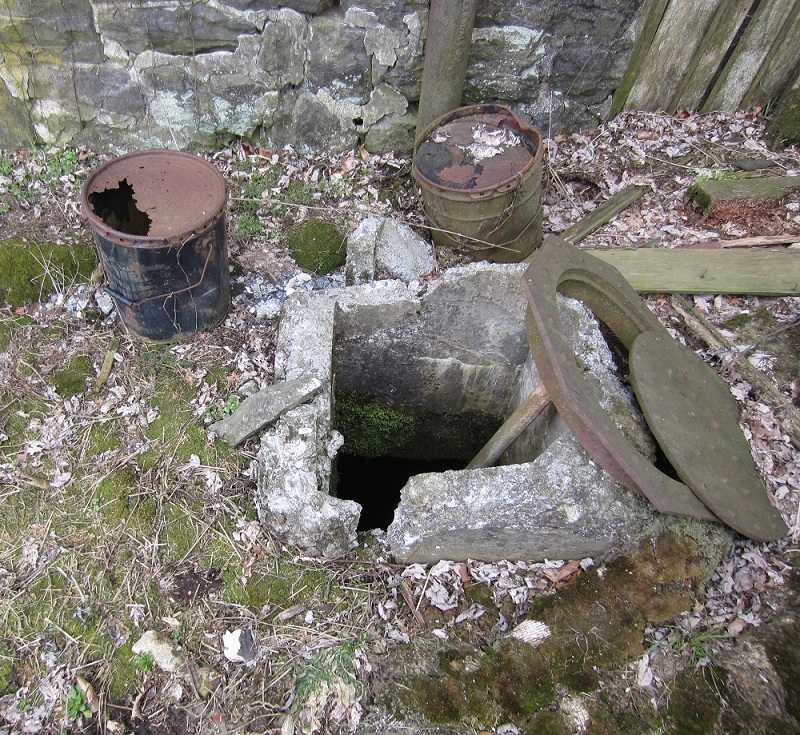 There is a well or cistern next to it. That tree means to be there. This is interesting. What’s visible down there? Looks dark and spooky, better get a closer look. It has a square top opening and is round underneath. Beneath the water it looks like the a top of a stoneware jug, or an old cone top beer can submerged under there, but it may just be an old funnel. The east back corner. 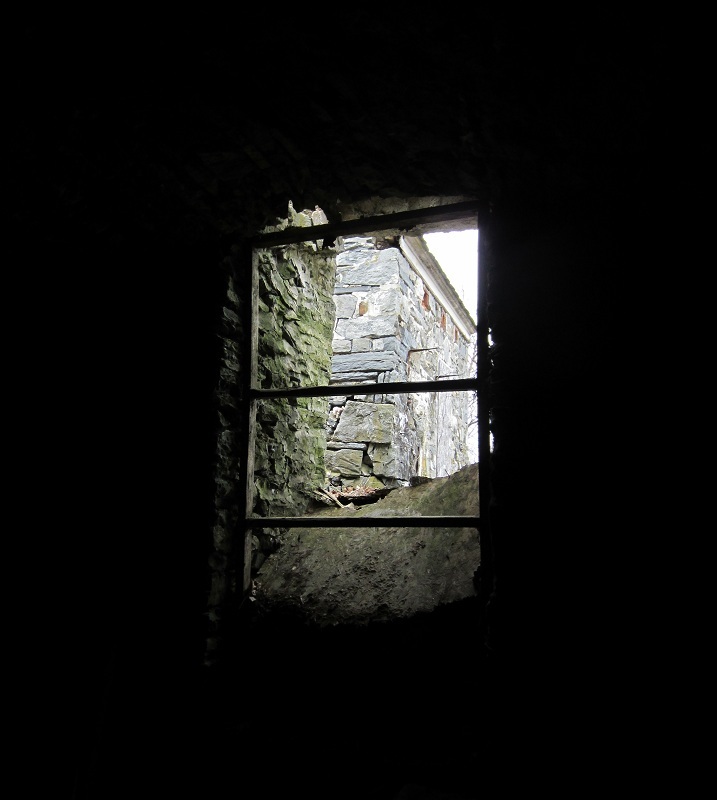 There is something most interesting to the left, a dark opening and also the added side room. A smokehouse? A privy? Note the brick vent holes around the top. Though not completely sure what this sideroom was, what’s directly to the left of it proved a most fascinating experience. 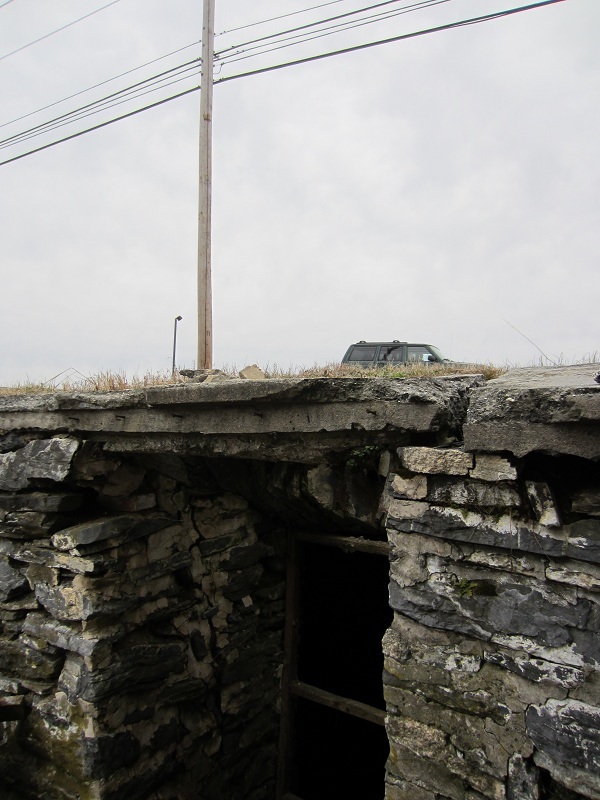 Earlier, I mentioned when showing a picture of the front of the house, the ground below being most unusual. This is what I was referring to; a very creepy dark opening. 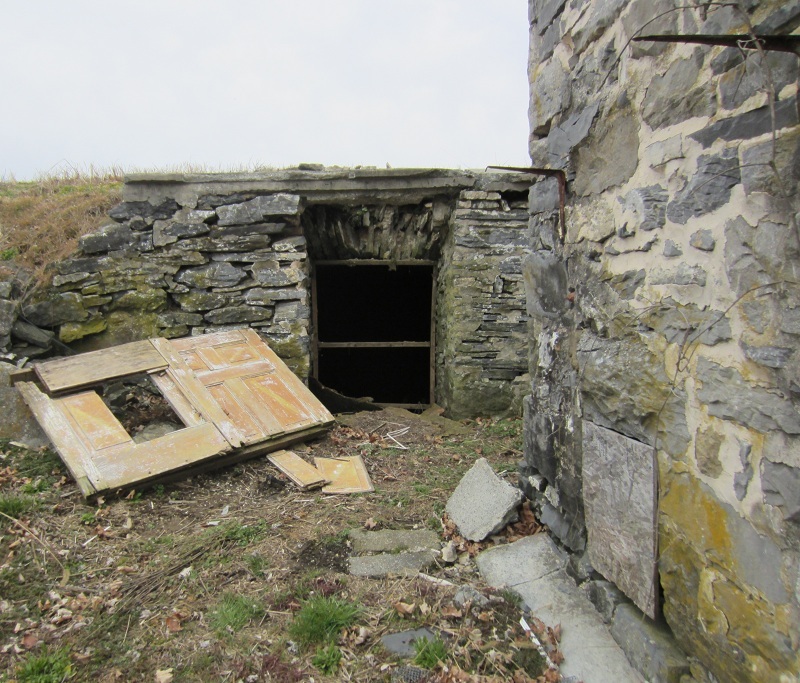 Although apparently shut at one time, the partial door has been laying aside for some time now. This was a totally unexpected find. From the road, you’d have no idea this fascinating opening was there. The underground cavern almost extends to the road. So bright outside. What could possibly be in there in the darkness? This was really starting to become interesting. 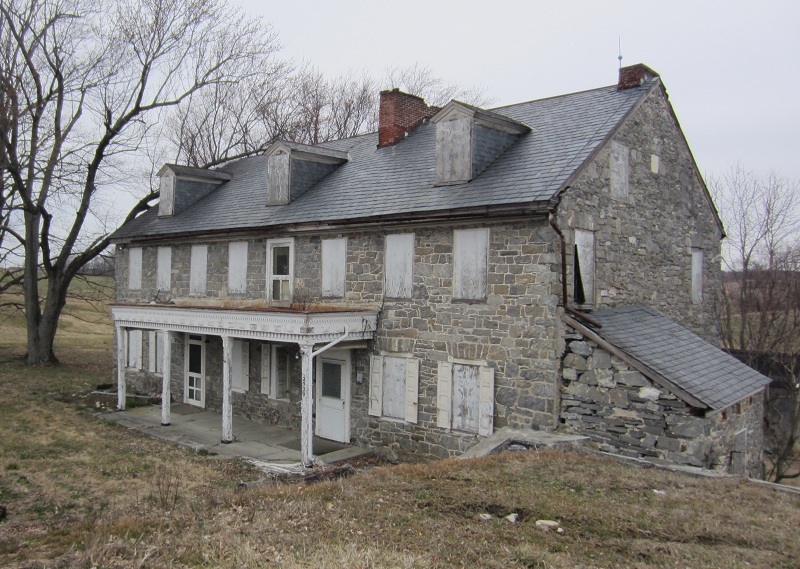 Local history exploring and now possibly ghost hunting? Count me in, even if the opening itself looks like a hair raising experience. There’s a car passing by right there, how scary can this be? 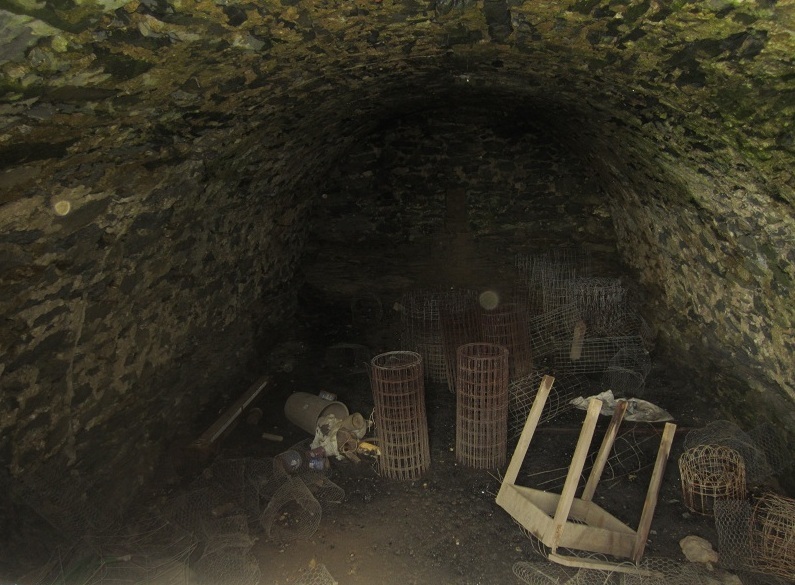 A flash shot into the cavern and aside from some 20th Century trash and refuse, note the cavern itself, the hand built arched walled space. It’s quite amazing. 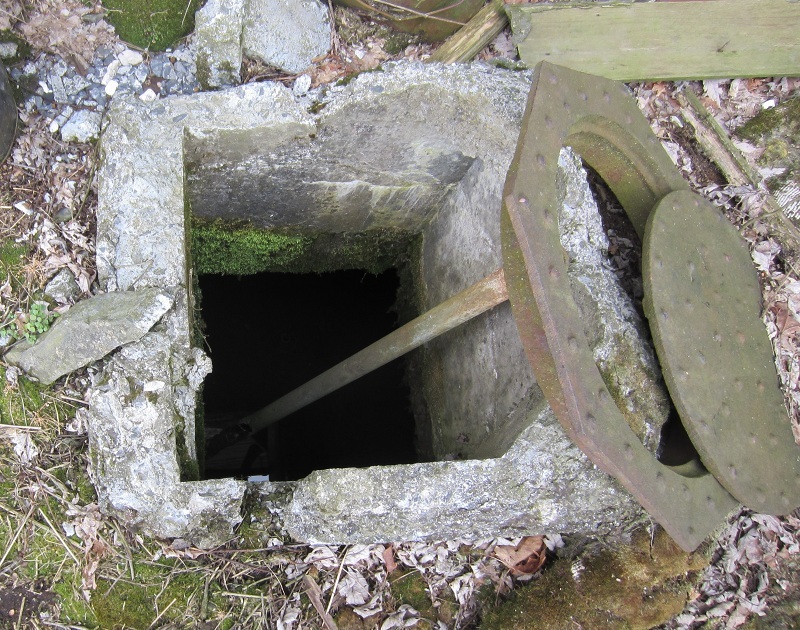 It appears to go back some 30 feet, and is approximately 10 feet wide and 8 feet high. Most amazingly, note the motes. Or, are they? There are two large dust motes, or “Orbs,” as ghost hunters call them. I’m sure they’re just dust motes, but it is very interesting that the largest one above the three foot high rolled fences is the size of a cantalope from the distance of almost 20 feet away. Is it really a dust mote? There is a brighter one to the left that either reflects light or casts its own. Not being visible without the flash, I would suspect these are mere dust motes. In a photograph like this, one usually finds a shower of them. Also, they’re supposed to appear much closer to the camera. How odd to see a similar two in different areas and in such large sizes. 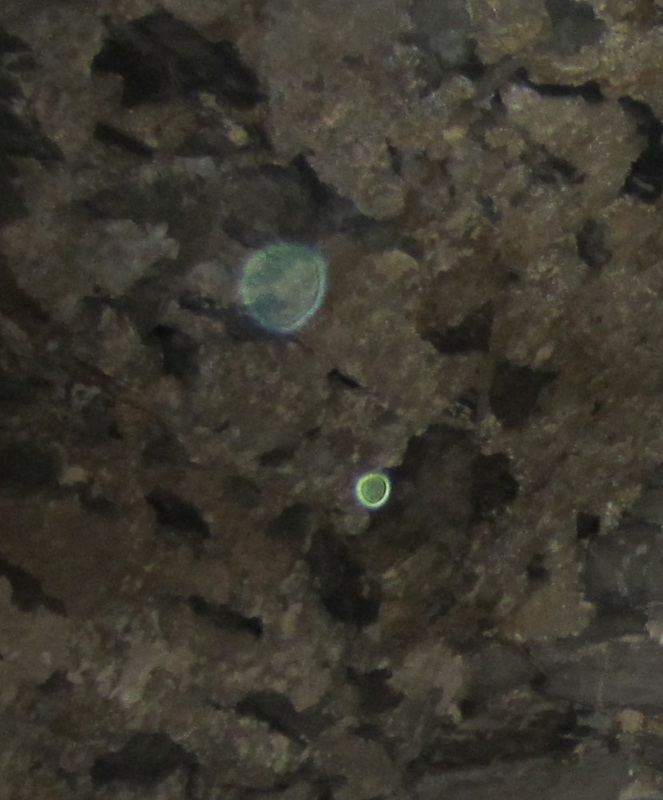 Below is a cropped close up of the center large mote or orb and then the one on the left. Again, no tomfoolery whatsoever, all photographs are exactly as the camera took them. I didn’t even know I was capturing these until seeing the photographs later at home. I read that dust motes are only visible near the camera lens and that they are usually perfectly round as that’s how the light reflects off of them. I’m sure this is a dust mote, but it’s a bit freaky to see it like this at a distance of almost 20 feet away. It’s a big one. 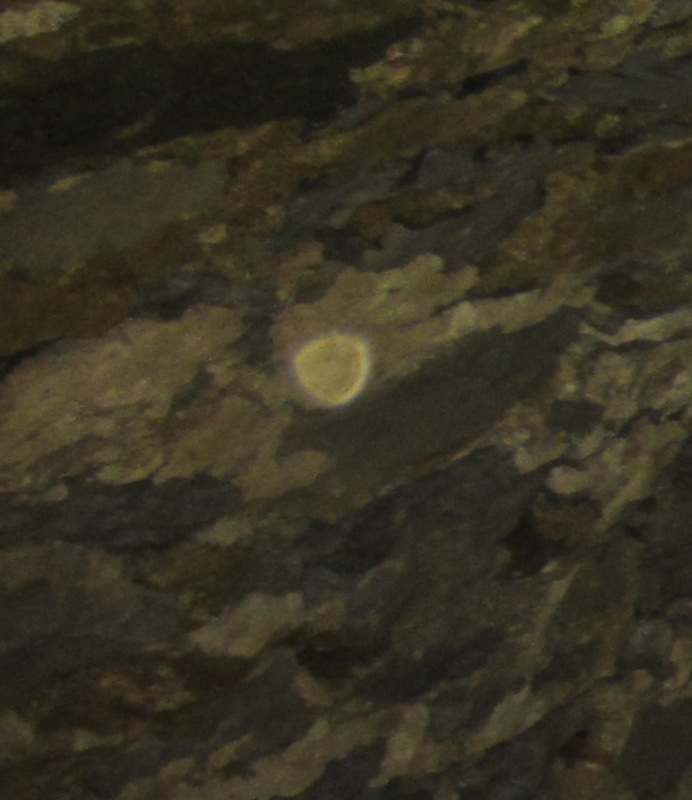 Dust mote or apparitional orb? This is the one on the upper left, both are only cropped to show a close up detail. Note this mote glows, or reflects light more than the larger one further away as this one was closer to the flash. It also appears to be emerging from the arched ceiling. 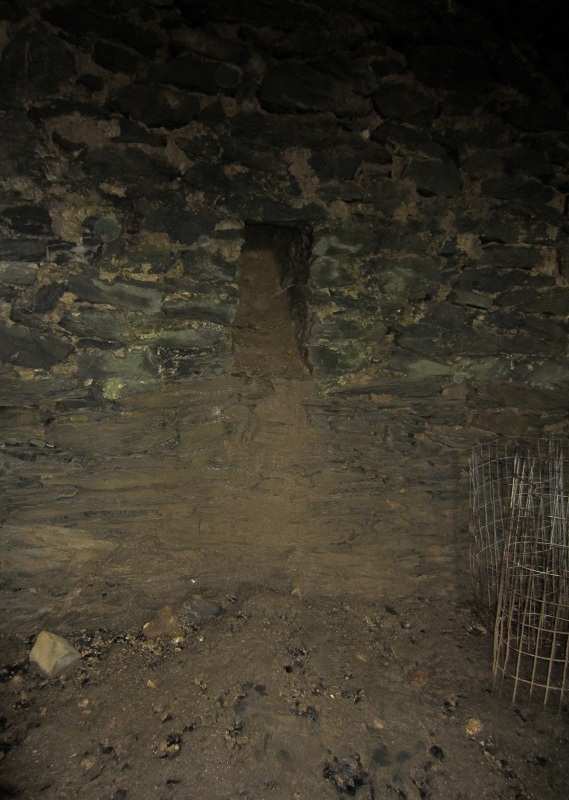 Stepping down into the cavern, I snapped this picture to show the back wall and what appears to be a chute that coal was poured down through. The large mote or orb has moved further away but is still quite visible and remains equivalent in its large size. This is really something, or nothing at all, but if it is something, I had no idea it was there at the time. 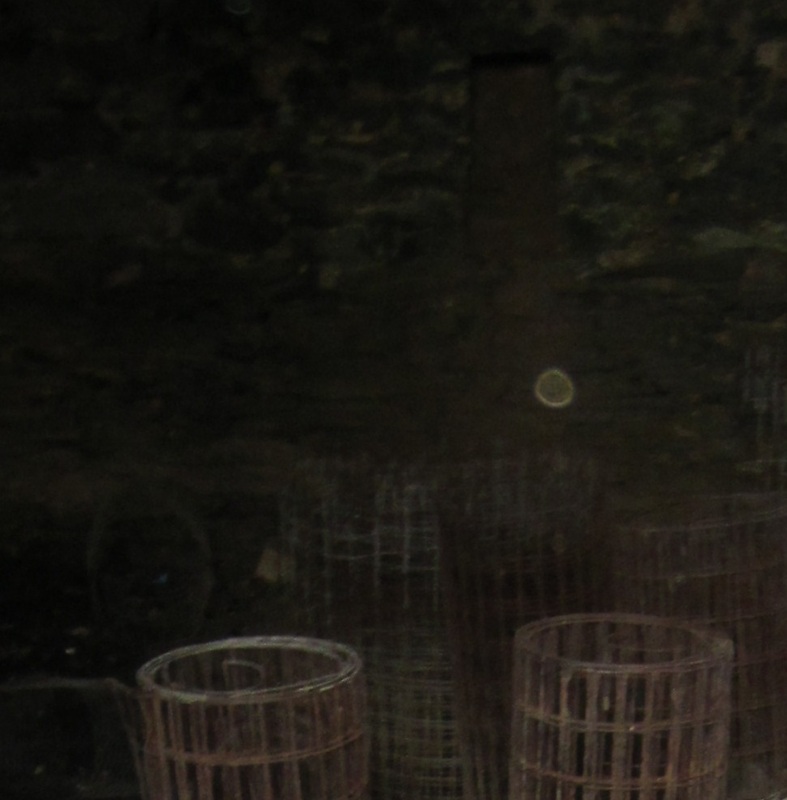 This picture taken a few seconds later shows two very distinct motes or orbs at upper left. Note the smaller one is colored a neon green. Below is a cropped pic from the full sized 4000 x 3000 pixel photograph. These dust motes or apparitions in orb form, stir the imagination. Note the detail and what appears to be a ‘moon’ face on the larger one, and it has ‘contrails’ as if moving downward to the right. The smaller neon green one is amazing and seems to give off its own light despite the flash of the camera. It almost has a cartoonish face if looked at closely. This is the most beautiful and mesmerizing dust I’ve ever seen. There was more, yet I knew of none of it at the time. 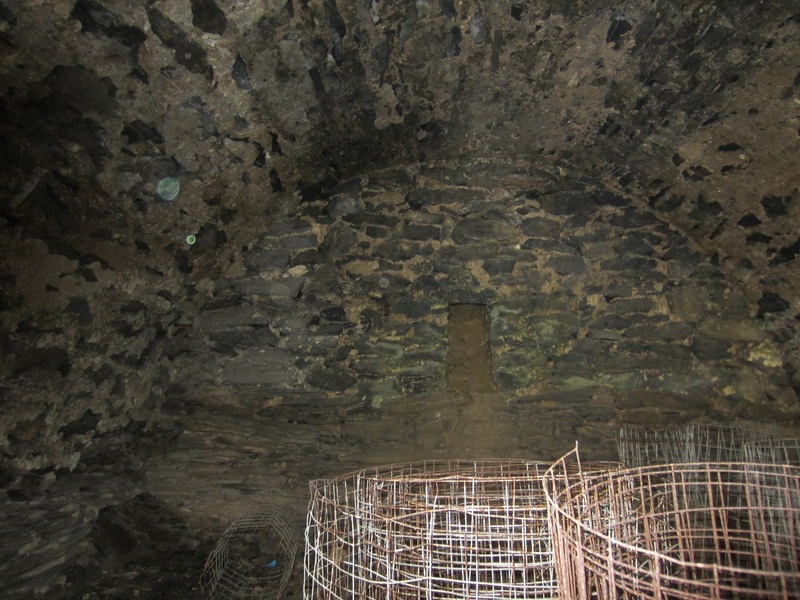 Below is the back wall showing the coal chute. There is a mote or orb on the left and another just left above of the chute. 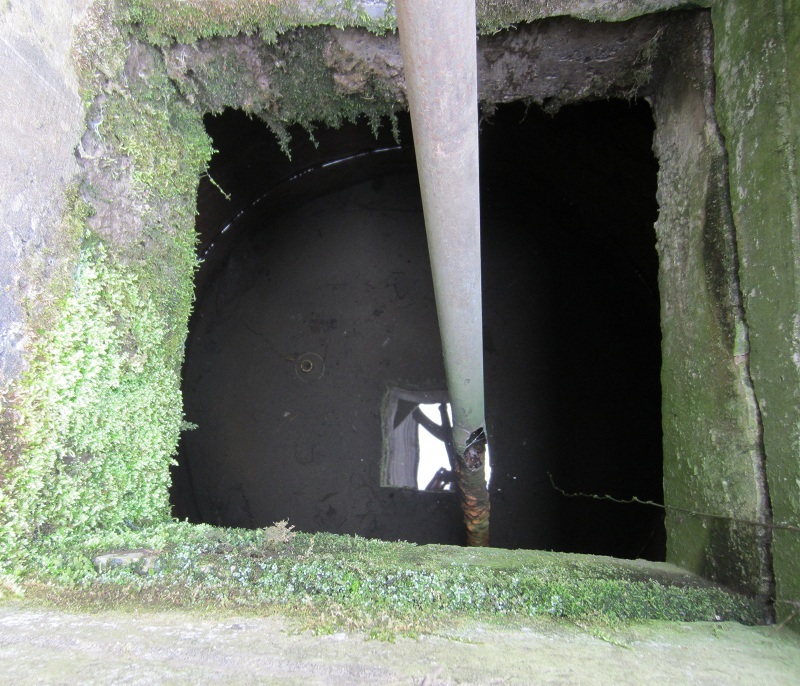 It was surprisingly dry in there, no mold, no dampness, or drips of water whatsoever. I took some more photographs, but I didn’t stay in there for a very long time. 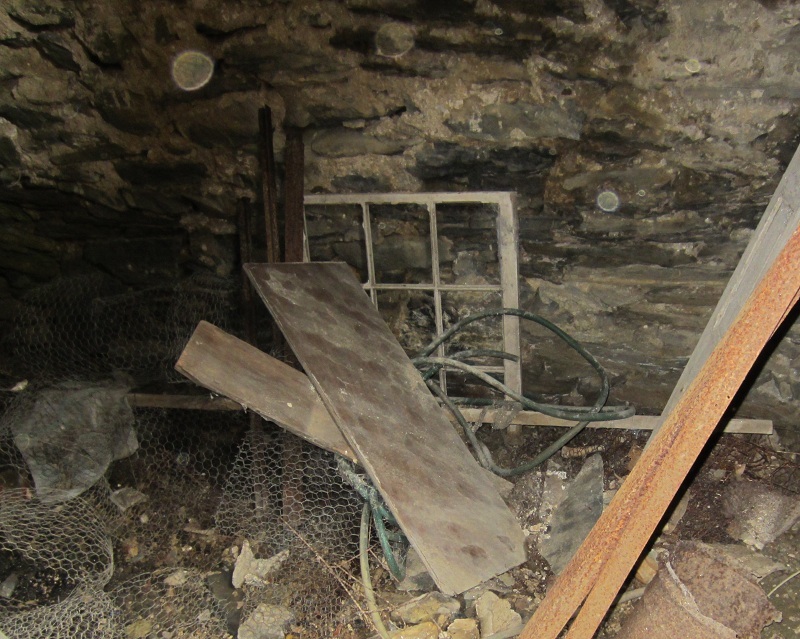 Below is a photograph of a corner near the opening featuring a likely original window from the house and assorted debris. Note the motes, they look like the same pair seen earlier, plus a third one top center. Maybe a ghostly friend joined in to see what I was doing. 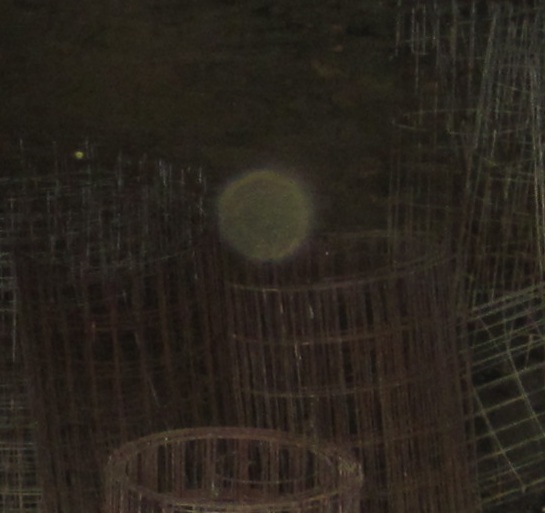 Below is a cropped close up detail of the 3 motes or orbs in the corner. Coming back closer to the lighted entrance, I noticed something interesting on the ground, which consisted of coal gravel. First I saw the glass fragments, then taking a closer look, there is a bone, and next to that a .44 caliber bullet shell. I really didn’t know what to make of this. At that point my curiousity was sated enough to know that this is a really wonderful historical place. 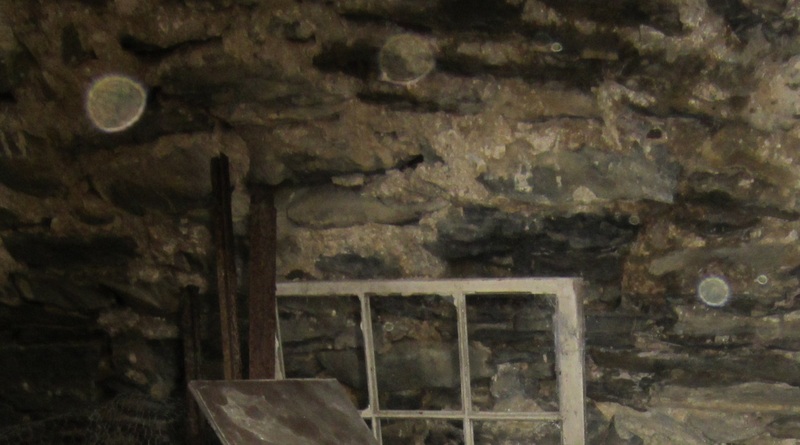 I had never been in an early 19th Century coal cavern before and didn’t even know they existed. 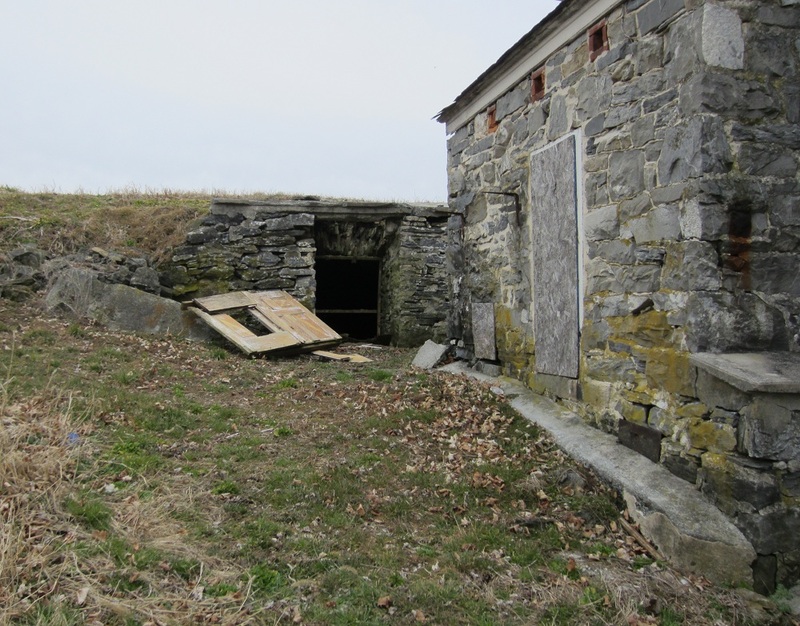 This may have been a root cellar or cold storage, but the chute at the far end and the gravel coal floor leads me to believe it was used as a coal storage bunker. Quite a journey in a day. I still am fascinated by the beauty and possibly paranormal nature of these. I live in a 1780 farmhouse which is quite dusty itself at times and I’ve taken countless pictures in any and every lighting condition there and nothing like this has ever showed up in any of those pictures. Looking back now, I really like the below photograph showing the way out to the light of day. It’s really unbelieveable living within ten minutes from a place like this. Beautiful and almost haunting local history.